Houston is a big city but the more we know about it, the smaller it feels. In an effort to better understand the local government, the BigKidSmallCity crew spent the election season meeting the people involved. 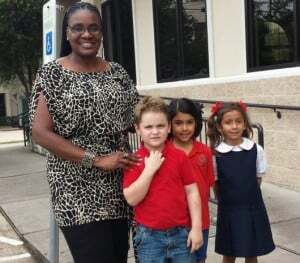 Now we want to congratulate Wanda Adams on winning the HISD Trustee District IX election! The kids (ages 4-7) interviewed her to find out what she likes about Houston. Read on to see what she thinks about our great city! 1. What do you like to do in Houston? I am a big kid at heart. I love going to the Houston Zoo, Hermann Park and Miller Outdoor Theatre in District D. I like to go to the nice restaurants and I like to ride horses. I even get to ride the mounted patrol sometimes and that is a lot of fun. I am also a Political Science Professor at Texas Southern University. 2. What is your favorite thing about Houston? I was born here! I also love the good food! 3. What is your favorite Houston annual event? I like the back to school fair in District D where we help provide immunizations and supplies to get our kids ready for school. I also like to ride in the Thanksgiving Day Parade.